Southampton’s much-improved performances of late finally paid dividends as they emerged 2-1 victors over Spurs in a brilliant comeback last Saturday, with Yan Valery scoring for the second consecutive game. The Frenchman is the epitome of the belief which Ralph Hasenhuttl has instilled in his squad, and the faith he has placed in younger players is making a huge difference as the Saints look to steer clear of relegation. The Austrian boss has taken a polarised approach to that of his predecessor, trusting the likes of Valery, Jan Bednarek and James Ward-Prowse – all of whom have repaid him – in the starting XI, as opposed to more experienced members of the squad. Despite having only made his first appearance for Saints in December, the 20-year-old is now an established player in the starting XI and the numbers behind his performances since Hasenhuttl took the helm show exactly why that is the case. In 12 Premier League starts since the 1-0 loss to Cardiff – Hasenhuttl’s first game in charge in which Valery played at right-back rather than right-wing-back – the number 43 has completed 2.2 tackles and 1.1 interceptions on average, indicating his defensive importance. In comparison, Ryan Bertrand completes 2.1 and 1.1 per game respectively – the former Chelsea man is regarded as one of Southampton’s most reliable performers – and Spurs’ Kieran Trippier, who has proven himself as a quality wing-back, completes 2.3 and 0.9. Clearly, Valery is playing beyond his years in terms of his defensive contribution, but what about his influence on the front foot? Well, his thunderbolt against the Red Devils was a cracking way to open his account in red and white and he doubled his tally for the season next time out as he bundled home at the back post against Mauricio Pochettino’s men. For the sake of consistency, 28-year-old Trippier has scored just once this campaign despite regularly taking free-kicks for Spurs, while 29-year-old Bertrand also has the single strike to his name. It’s in his willingness to take his opponent on, though, where Valery truly shines – the academy graduate completes 1.3 dribbles per start while former Saints captain Bertrand and England hero Tripper average 0.1 and 0.8 per game, respectively. This directness has been crucial and the defender’s willingness to get forward is the reason why he was able to net his second goal of the campaign last weekend. It’s unlikely we would have seen him do this under previous Saints boss Mark Hughes. Valery, who was given far less license to get forward prior to Hasenhuttl’s arrival, completed 0 dribbles under the Welshman. He has shown now, that he is a threat on the front foot when given space. Standing at 5’11”, the Champigny-sur-Marne-born starlet wins his fair share of aerial duels, too – 1.7 per start on average, to be exact – while Cedric Soares, whom Valery has replaced, completed just 1.3 per game before upping sticks to Inter Milan in January. 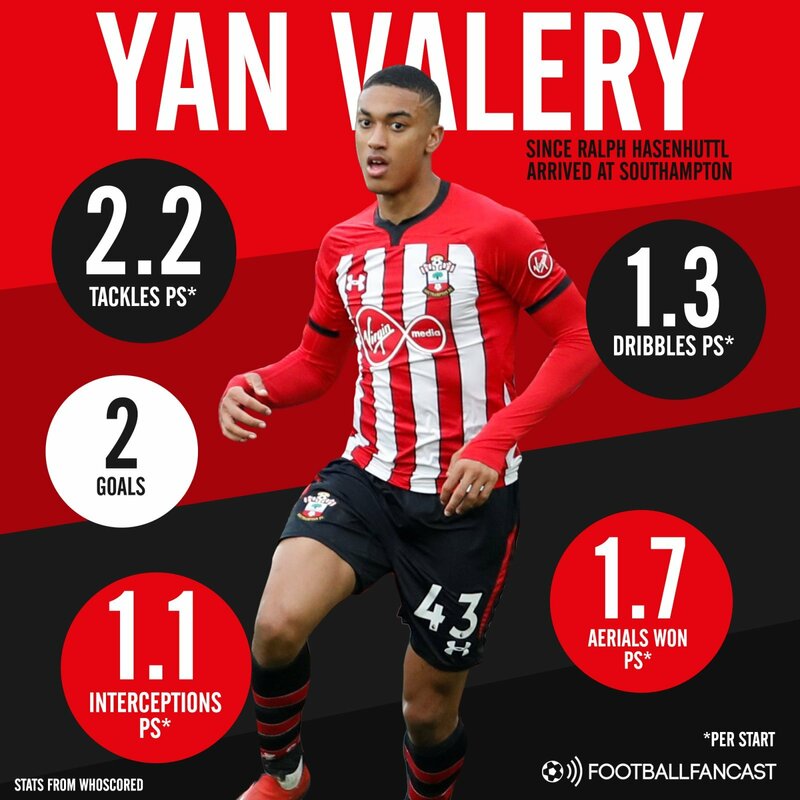 There is plenty of tangible statistical evidence to justify Southampton’s decision to extend Valery’s contract on Thursday until 2023 – if any was even needed – and it’s already clear to see that Hasenhuttl has unearthed a real gem of a player. The victory over Spurs was huge but the Saints remain just two points above the drop zone and it could go down to the wire. Don’t bet against Valery being crucial in the bid for survival.